If you are looking for tools and accessories for your paper drill machine, you've come to the perfect place. MyBinding.com carries a wide range of accessories, drill bit lubricants, chuck release keys, drill blocks, and more for all of your paper drilling needs. Save time, money, and increase productivity and the longevity of your paper drill machines with these paper drill accessories from Lassco Wizer and other manufacturers. Shop now and save. Reduces friction and heat during drilling. Improves performance and extends drill bit life when correctly applied. Fits Spinnit and Challenge Paper Drill machines. Diameter: 1-1/4", 1-3/8", 1-1/2" or 3"
Thickness: 1/4", 3/4" or 6"
For use with the Lassco Wizer Spinnit EBM-2.1 and EBM-2 Paper Drills. Make Lassco Wizer EBM2 or EBM2.1 paper drill more effective and productive. Dimensions: 16" x 2" x 1/2" or 25" x 2" x 1/2"
Simple ergonomic hand-held style for ease-of-use. Accepts most styles of drill bits. Constructed with a solid carbide cutting head. Precision sharpener with self-seating, lathe type construction on a heavy base. Accepts style A and L drill bits. Comes with suction feet for stability, or remove them for mounting. For use with Lassco Wizer Spinnit paper drills using style A and L drill bits. Easily removes chips from all styles of hollow drill bits. Dimension (L x W x H): 3" x 1" x .50"
Designed for most single-spindle drills. Place sharpener under drill bit and bring down drilling head. No need to remove drill bit. Magnetic base for convenient storage and immediate availability. Welcome to MyBinding video. 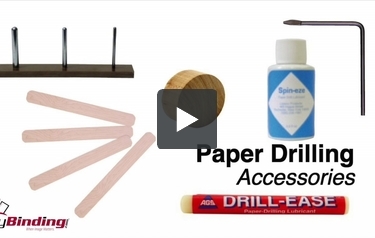 If you’ve already purchased, already owned, or planning to purchase a paper drill, you’re going to need some accessories. Accessories such as tools to keep things maintained and working properly, supplies when things run out or you need new, new and different size paper drill bits, drill bit sharpeners and last but not least wax and lubricants because smooth is the new sharp. Happy drilling. For more demos, reviews and how-to’s, check out MyBinding.com.